Today is the autumnal equinox in the Northern Hemisphere, and the vernal equinox in the Southern Hemisphere. It occurs at 14:49 Universal Time. 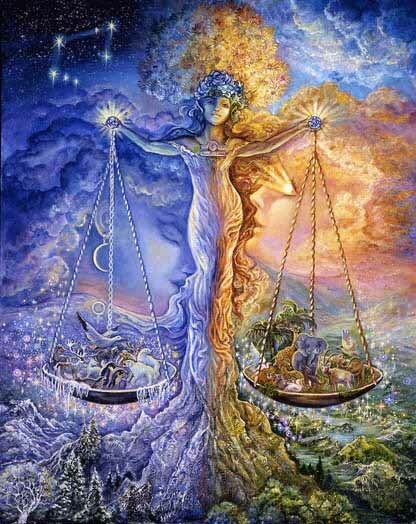 The September equinox marks a point of perfect balance. Earthsky: "The name ‘equinox’ comes from the Latin aequus (equal) and nox (night)." North and South are balanced, as the Earth is tilting neither toward nor away from the Sun. Today, the length of day and night are equal, hailing the arrival of a new season. No matter where you are, the equinox also balances East and West (the sun will rise precisely in the East and set in the exact West). Symbolically, it is a day for finding direction. In Chinese culture, this equinox is associated with looking westward toward dreams and visions, and with white tigers and the colour white in general. In the Northern Hemisphere, this day traditionally was and is observed with bringing in the year's bounty at harvest festivals. Myths and astrology alike draw from this astronomical symbolism. There is an element of reckoning in the start of the Libran period: it is a time of realistically assessing what has been harvested in the present, and, with the past in this manner put to rest, dreaming of the future. Wishing you the best on this joyful day. Best wishes to you as well Mary, thank you for reading.